On Slippery Rock! the group sets their sights on smooth jazz, and signifies on that much maligned sub-genre for a solid hour. The smooth jazz elements aren’t overtly obvious here – no David Sanborn covers, no awful 80s synths, no cheesy vocals. The music is all original, and the “smooth jazz” elements consist of, among others, a collection of tasty drum kit grooves from Kevin Shea and plenty of catchy hooks and pop-inspired licks from the band’s front line. The elements that MOPDTK fans enjoy about the band are here in abundance: a ridiculously powerful front line in trumpeter Peter Evans and saxophonist Jon Irabagon; a rhythm section in bassist Moppa Elliott and Shea that somehow manages to play tight and loose at the same time, which allows for the music to go in any direction at any time – inside, outside, sideways, whatever; and perhaps most importantly is the band’s mixture of its serious and total commitment to their music with irreverence and humor. “Yo, Yeo, Yough” – Mostly Other People Do the Killing from Yuan Liu on Vimeo. Two of my other favorite tracks include “President Polk” and “Is Granny Spry?” The former is a treble heavy tightrope ballet from Evans on piccolo trumpet and Irabagon on sopranino. The latter track closes the album, which has a nice mix of choice backbeat grooves, some seriously firebrand trumpet soloing from Evans, and Irabagon’s use of smooth pop lines, sheets of sound, and then what almost sounds like chicken clucks. In fact it’s the numerous directions the band takes and the diverse ideas and musical signifiers at play in “Is Granny Spry?” that detractors of the band might point to in explaining their distaste: it’s too whacky and tongue-in-cheek, the tune doesn’t have a single identity, the soloists overplay, the mix of pop and a more out approach doesn’t work, etc. 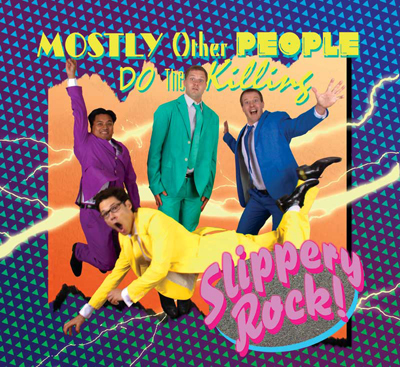 For me, those are all reasons why MOPDTK, and in turn Slippery Rock!, are both great: nothing is off limits, everything is tackled with the strongest conviction, and is done so with the highest musicianship and chops out there. So if you like the group, or weren’t familiar with them but watched the video I linked to and dug it, go get Slippery Rock!, as it’s the group’s best studio album yet.